I'm coming to you once again from Seattle, where later today I am interviewing Stripe co-founder John Collison at the GeekWire Summit. Speaking of which, we have guests. So please make the GeekWire Summit attendees feel welcome. We want them to stick around. These days it is tough to have a tech conference without things getting political. Such was the case Tuesday, as immigration issues took center stage at the GeekWire Summit in Seattle. Buzz: There were impassioned speeches from expected corners, including Microsoft president Brad Smith, who has promised President Trump will have to go through him to deport any Microsoft Dreamers, and Washington Attorney General Bob Ferguson, who has sued the federal government 19 times since Trump took office. But the most powerful voices came from a pair of immigrants, who the conference organizers gave the stage in an effort to put real faces and stories into the conversation. 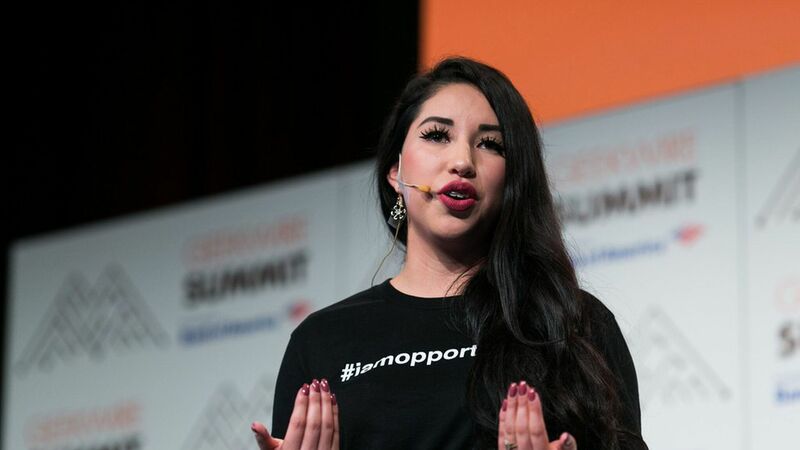 The Dreamer: Citlaly Ramirez spoke about coming to America at age 8, learning to speak English, and advancing from ESL classes to honors classes to earning a scholarship at Western Washington University to study technology. Ramirez, now a junior at WWU, is one of the 800,000 Dreamers whose legal ability to work has been cast in doubt. The Entrepreneur: Venture Kits CEO Leslie Feinzaig, who grew up in Costa Rica but whose family is of Polish ancestry, talked about the pain she experienced seeing Nazis marching recently in Charlottesville while remember the pictures of her grandparents who were forced to leave Poland. "If you, unlike me, get a vote, I ask that you put your humanity over politics," she said. "It's an extremely anxious time," said Chan, who works for MacDonald Hoague & Bayless. "There is so much noise every day. iI's very difficult to separate the noise from fact." For decades, Rust Belt cities have been seen as decaying manufacturing centers struggling to reinvent themselves. Now, central Pennsylvania — comprised of the smaller cities of York, Lancaster and Harrisburg — is trying to leverage its long history of manufacturing as the foundation for a vibrant robotics hub, Axios' Kim Hart reports. Pivot to robotics: A skilled workforce that knows how to work with their hands and tinker with machines is a great fit for building robots, says John McElligott, CEO of York Exponential, which is working on deploying "collaborative robots" (or "cobots"). He believes robots will work alongside humans rather than displace them completely. The problem: Not enough workers — because people just aren't enthusiastic about going into manufacturing. "There's not a skills gap in manufacturing, there's an interest gap," McElligott said. More: Read the rest of Kim's dispatch from Pennsylvania. Today, she's in Ann Arbor, Mich., for the second stop of Steve Case's "Rise of the Rest" tour exploring how cities around the country are making an economic comeback. Cyngn, a Silicon Valley startup that raised $115 million to build a more open flavor of the Android mobile operating system, has changed course. Axios' Kia Kokalitcheva reports the company is now working on autonomous driving technology. information on its website and job listings. its recent permit to test self-driving cars on public roadways from California's Department of Motor Vehicles. changes in the team (CEO Lior Tal has been with the company for a while, but the rest of Cyngn's 30 or so employees appear to have joined since the strategy shift, per LinkedIn records). U.K. Prime Minister Teresa May's administration said Tuesday that her cabinet is considering regulating Google and Facebook as news organizations, rather than being treated like pure tech companies. Axios' Sara Fischer and David McCabe report that May's actions stand in sharp contrast with American officials, who have been slow to act. Why it matters: The speed of the U.K.'s deliberations means that the U.S. is falling behind, even though it was the U.S. election nearly a year ago that drew the most attention to the issue. While May and her Cabinet threaten steep fines, Congress has yet to hold its first hearing with the companies. And, Silicon Valley has also responded more slowly stateside than in Europe. Sound smart: There's been a quiet drumbeat of skepticism of large tech companies all year in Washington, but it initially didn't gain a lot of traction on Capitol Hill or support from President Trump — who has yet to acknowledge Russian interference in the election. It took the announcement last month by Facebook that it had found Russian ads purchased during the election to really move the needle. Go deeper: David and Sara have more here, including a timeline of past events and what's to come. Even though it has yet to pick a city for its second headquarters, Amazon consumer chief Jeff Wilke said the company may some day look for a third city to call home. "Possibly" he said, speaking at GeekWire Summit on Tuesday. "Let's worry about HQ2 first." What's happening now: Next week is the deadline for cities to respond to Amazon's call for proposals. They expect to select the location next year. On that front, Wilke didn't tip his hand, other than to say Amazon is unlikely to be swayed by gifts like the cactus he got from Arizona or promises to rename a city after the company. "I think we are going to be more practical in terms of what's important to us," Wilke said. In addition to things like tax incentives, Wilke said he would like to see a commitment by the new headquarter's city to include a focus on science, technology, and math in the local public schools. On tap: GeekWire Summit continues in Seattle with Microsoft CEO Satya Nadella kicking off the day...Facebook is holding its Oculus Connect event in San Jose...BoxWorks continues in San Francisco...It's also National Coming Out Day. ICYMI: Facebook introduces a CrowdTangle product for local news, Axios' Sara Fischer reports...Meanwhile, Facebook CEO Mark Zuckerberg apologized for a tone-deaf use of VR to highlight efforts in Puerto Rico, TechCrunch writes...Google is buying podcasting startup 60db...Mobile developer Felix Krause has demonstrated how an iOS app developer could create a convincing pop-up that mimics how the iPhone asks users to enter their iCloud credentials...A glitch led Dow Jones to erroneously report that Google was buying Apple, briefly causing Apple stock to rise as computers started trading on the news, per TechCrunch...The Verge says Google issued a software update for its just-released Google Home Mini after a small number of the smart speakers were recording users unprompted. The Force is strong with these robot vacuums.